This post was sponsored by TomTom. I have struggled with direction my whole life. Not the existential kind of direction (although that’s true, too) but the practical kind. I am constantly lost. I have no internal compass whatsoever. When you’re about to hit a pinata with a blindfold on, and someone spins you around to disorient you first? That’s my baseline. I’ve been this way my entire life and have tried a myriad of strategies to fix it, but there is just something broken. It’s like a special learning disabilities related to directions. I can’t count the amount of times someone has told me “It’s super simple. I’ll just give you the directions!” And as they talk, simple concepts like right and left and east and west just float out of my brain. I have no retention for it. “Turn left, then your next left, then the 2nd right” is a thing my brain cannot hold. Being bad with directions is a funny quirk until it’s not. There are plenty of stories that we look back and laugh on. The time that I got lost coming home from a Blockbuster that is right by my house. The fact that I have to use GPS to get to my friend’s house who lives in the same town, whose home I’ve visited at last 50 times. The times I’ve had to set my car’s alarm off remotely in order to find it in a parking lot. But then there are the not-so-funny times. The time I spent an hour and a half canvassing the Disney parking lot with four tired kids in tow because I forgot where I parked my car. The many times, before modern GPS technology, that I stared at a Thomas Guide in tears trying to figure out where I was. The frantic calls to Mark because a freeway had shut down and my phone wouldn’t give me a detour option. The sheer terror I feel when I have to rent a car in a new city and drive myself somewhere I’ve never been. I’ve tried to mitigate this issue by being prepared. I used to print maps out before I went anywhere, but GPS technology has been a game-changer for me. Truly, it’s hard to imagine how I lived without it, and how frustrating it would be to try to navigate life as a mom without it. I recently got to try TomTom’s GO 500/600 and it is such an incredible tool. TomTom has a new MyDrive cloud tool that lets you plan your route before you leave the house and send it directly to your device so you can pop in the car and hit the road without having to stop and log in directions. It syncs with your phone and also gives live traffic updates. A feature I really love: if there is a freeway closure, you can direct it to divert you to another route. And the real-time traffic reports are such a help with the traffic we deal with every day. It maps out the fastest route and saves time by diverting me from traffic. Any other directionless folks out there? 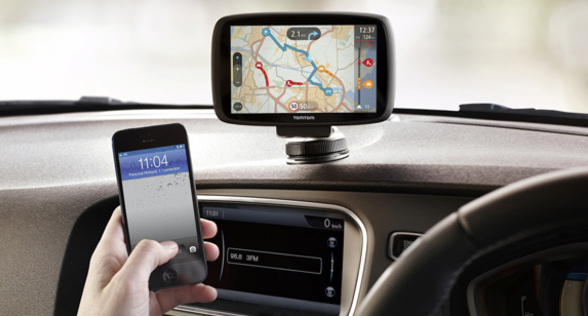 TomTom is offering my readers a giveway of one of their GO 500/600 devices. To enter to win, leave a comment about what you would do with the extra time you would save on the road if you could navigate around traffic to get to your destinations faster.